Rubenerd: Finally moving to Fastmail, or another provider? Finally moving to Fastmail, or another provider? Happy Sunday everyone, hope you had a lovely weekend. For your consideration and amusement, have a related screenshot from 2011! For many of us in the Anime@UTS executive team, and life in general, this weekend was a period of reflection. I continue to research alternative email systems for our executives to use, given the POP SquirrelMail mail system I inherited has been met with less than enthusiastic responses. Understandably so, in an age of AJAX, WYSIWYG and other acronyms, dependable old SquirrelMail running off a shared hosting account simply doesn’t cut it for them anymore. It got me thinking about so much of my own technology toolchain, and how I use things. As a product of the late 1980s, I was born into the last generation that didn’t have internet before primary school. When we did, we had Eudora, then Netscape Communicator, then Outlook Express. Around that time, we also experimented with Hotmail, then with time Gmail. Still, whether it was before I moved off Google or not, I’ve found myself using traditional desktop email clients. Crusty enough for you? Oh wait, it gets worse. You’re so not ready for this. I’m serious, you may want to get a drink of water first. I still use POP. Admittedly, I’ve configured my server for secure mail access and authentication, but I download all my messages onto my local machine for storage and home backup. This has had several implications; perhaps most importantly I can’t reliably check mail on my iPhone or iPad. 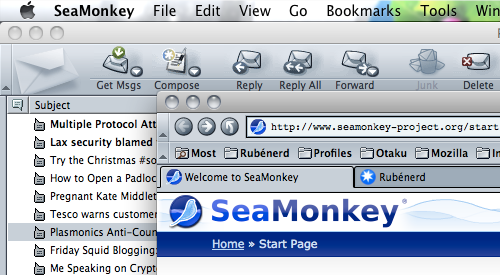 I can log into the server from them and view messages that haven’t yet been downloaded by SeaMonkey Mail on my MacBook Air, but as soon as they are, they disappear from my aforementioned mobile devices. In the past, this hasn’t been so much of an issue. Even though my primary machines have usually been desktops, I’ve also been tied at the hip to a laptop for most of my life. Regardless of whether I was at high school, university, work, coffee shops, libraries or the like, my laptop has been with me, and with it my email. It has given me several advantages. I use OpenPGP to send signed and encrypted mail that would be infeasible. (at least, to my knowledge) from a mobile device with the default mail app. I have every message I’ve sent or received since 1997 in one convenient, encrypted, indexed archive that nobody else can reasonably get to. There’s something reassuring about that. And yet, I feel the method is starting to fail me. Dealing with potential clients and jobs, urgent university messages and the like, a few hour gap between receiving a message and responding seems too long. As I will with Anime@UTS, I may have to start looking into IMAP email providers. I could try hosting myself, but the burden of maintaining white listings on all the spam systems and dealing with abuses seem far too troublesome and expensive to attempt in 2014. I’ve heard good things about Fastmail; their servers are based in New York, but they’re an Australian company. Time to… start sending some email.